As we look for ways to extend our living space and enhance a home, a do-it-yourself construction option is the way many of us look for. But doing it yourself has many pitfalls, not least of which is acquiring the skills and knowledge to be able to tackle a project professionally and in accordance with building regulations. Before you start any project you are going to need the services of a draughtsman or architectural designer. These professionals need to assess and evaluate the ideas you have in mind and put them down on paper as a workable plan, that will not only be of benefit to you, but also be submitted to your local municipality for planning approval. Miss out this step and you could end up having to tear down your project later on. More often than not your extension or add-on will require some kind of roof, and a framed timber roof - or roof truss - is the most affordable way to go. There are many timber suppliers that offer custom roof trusses, designed in accordance with drawn and approved plans, and these obviously make any DIY project that much easier. There are many different styles of roof trusses available; you could be extremely complex or simple in your choice. Using roof trusses increases efficiency and production when constructing your home. They offer a less labour-intensive option than the regular type of framing which saves time in the building process. 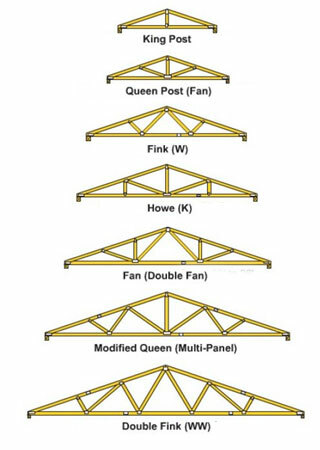 The simpler type of roof trusses are the Kingpost, the Queenpost, Fink, Howe and Fan roof trusses. They all have the traditional triangular roof shape, with various types of added support, all depending on the needs of the structure. 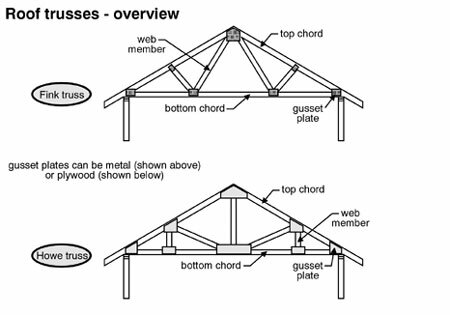 One of the most popular types of roof trusses is the dropped chord truss. It is a bi-section design that uses other trusses to prevent the roof from rising up. If the roof did rise up, there could be damage occurring to the walls and the ceiling of the home. People that live in areas that have strong gusts of wind would find this the best type of truss to use. Truss roof designs are the greatest technology advancement in modern construction since the nail gun. They save time and money in the construction of homes, sheds, barns, and garages. Roof trusses have become the best affordable roofing option currently available in the market. More and more homeowners planning to carry out home improvement projects that involve roofing are calling up a supplier to order roof trusses due to their flexibility. 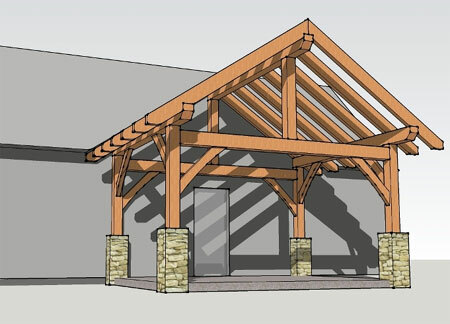 If you are planning to build something as simple as a pergola, garden shed or hut, ordering a roof truss might be a bit over the top when you consider how easy it is to make your own. However, there are a few basic jointing techniques that you should know before you start. 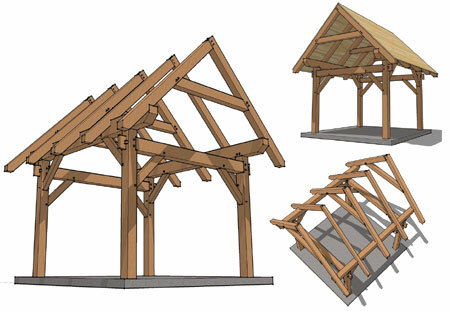 When designing a basic roof truss for a simple structure, such as a covered pergola, garden shed or garden hut, there are a few basic roofing joints. 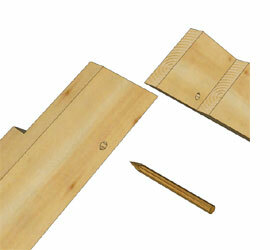 The most basic method for joining two timbers together is the half lap joint. One timber has half its depth cut away on the top and one timber has half its depth cut away on the bottom and these two pieces lap over each other. 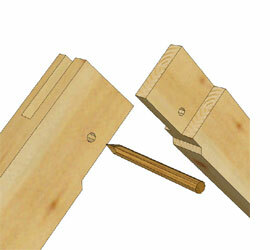 When timbers are directly supported with a foundation then this type of joint can be used. It is not the strongest just the simplest to cut. This joint is known as the tongue and fork joint. Here is an exploded view of two rafters at 12/12 pitch with an oak peg. These rough sawn rafters have also been reduced down to the next smaller in size at the joint locations to insure a proper fit. 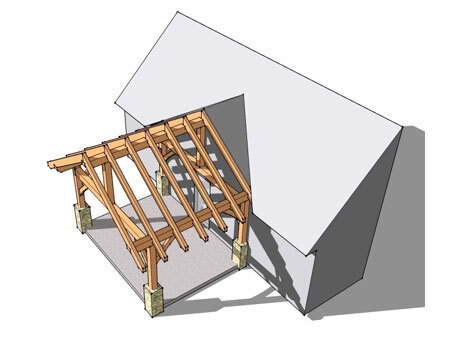 Know as half lap rafters, this is an exploded view of a pair of timber frame rafters where they meet at the ridge.